The cartoonishly evil Sheldon Adelson is a Jewish conspiracy theory incarnated. Which is why, no matter how much I despise his politics, election season bankrolling, and ethically dubious gambling empire, I can’t shake a creeping sense of tribal defensiveness when he’s depicted at his worst. Perhaps my mixed feelings result in a traditional Jewish desire to circle the wagons when faced with outside criticism. Adelson deserves derision, to be sure, but the critiques attract some ugly fellow-travelers spilling anti-Semitic bilge, using Adelson’s love of Israel to brand all of us Israel Firsters. It’s also hard at times to take Adelson seriously—he seems so ethically bankrupt and misguided that he must have been constructed for our deliberate provocation, a troll out of central casting. After all, the largesse he’s showered on the GOP is almost comical in its lack of discrimination. That Adelson chose to support Newt Gingrich—fatuous, bloviating Newt Gingrich, he of the moon bases and Dynasty-like personal life—makes one wonder if this isn’t an elaborate performance. The uber-rich can’t hunt humans for sport (not yet), so perhaps this game of GOP monopoly is the next best thing. But maybe I should step back and offer a primer for the uninitiated and some explanation for the extraordinary amount of time I’ve spent wondering about a man who could drown me in his change purse. An elderly, massively rich, transnational Jew who loudly declaims his love for Israel, Adelson is famous for donating tens of millions of dollars to GOP Super PACs—and for being unapologetic about a single thing he does. Adelson gave at least $105 million to Republican organizations in the 2012 election, and while nearly all of the candidates he supported lost, he recently said he plans to double his donations in 2016. He can afford much more. Adelson’s fortune now clocks in around $21.5 billion, most of it from his gambling interests. His Las Vegas Sands Corporation operates a number of casinos in Vegas, Pennsylvania, and Singapore, but now makes a majority of its money in Macau, the biggest gambling market in the world. The Department of Justice is investigating whether Las Vegas Sands committed money-laundering, which is in addition to a DoJ bribery investigation and one by Macau authorities looking into possible violations of privacy laws. Working in one of the most corrupt industries in some of the world’s most corrupt cities brings risks, I suppose. In Israel, Adelson is a great booster of Prime Minister Benjamin Netanyahu. He owns Yisrael HaYom, a right-wing newspaper that, after Barack Obama won re-election, featured the headline, “The US Voted Socialism.” Jingoistic and freely distributed, Yisrael HaYom has become the country’s leading newspaper, devastating the business of competitor papers like Maariv and Ha’aretz (a poor media economy hasn’t helped). So in sum: right wing, obscenely rich, an aggressive player in a business full of shady operators, mired in legal investigations, throws money around with the enthusiasm of a zayde treating his grandkids to lunch at the deli (except he deals in $10 million checks). If he visited the Upper West Side, one suspects he’d melt on arrival. No, what furthers jumbles my view of Adelson are the cartoons of him, particularly when he’s depicted as the most powerful man in the world—this elderly, money-grasping, hook-nosed Jew, a sybaritic smile on his face as he plays with his presidential marionettes. A certain tribal insecurity sets in. In considering Adelson, I’m also reminded of George Soros, another billionaire whose biography resembles that of an anti-Semitic caricature. I find Soros infinitely more respectable—his Open Society Institute does valuable work funding democracy-building initiatives around the world, and he supports socially useful efforts like drug policy reform. 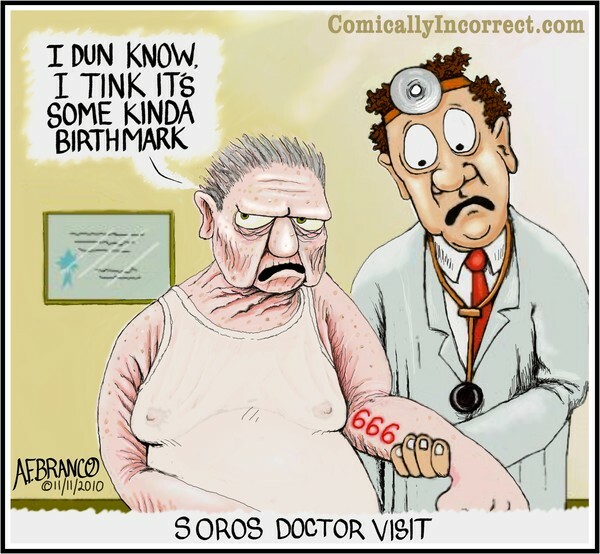 But Soros is also infamous for reaping huge profits by speculating on the British pound during a currency crisis and has an insider trading conviction (in France) on his record. He also seems more interested in using his vast wealth to game the political system to his advantage than lobbying for structural change. Revisiting some of Soros’ past comments about George W. Bush—in 2004, he said he’d donate his whole fortune if it would ensure Bush’s defeat, which was “the central focus of [his] life”—an uncomfortable resemblance develops. It’s not quite symmetry—America’s bifurcated politics too often creates false equivalences—and in Soros’ position, I would’ve said something similar. Even so, I better understand the right-wing paranoia that has long surrounded Soros, with Glenn Beck’s vatic histrionics being the most infamous example. I’m comfortable with neither Adelson nor Soros being the avatar of America’s broken campaign finance system and, by extension, its entire political system. Of course, as long as this system exists, there’ll be men like them. But there’s an undeniable way in which their Jewishness resurrects ugly stereotypes from earlier generations. In many ways, though, our political culture is equally retrograde—built upon stunning inequality, greased by untraceable cash, dependent on patronage. It just so happens that the most easily locatable villains, in recent years, are Jewish (the Kochs rarely speak to the media). So is Adelson a great antagonist or just a projection of my (our) anxieties about how the culture has gone astray? Do I resent him because of his politics or because of the uncomfortable spotlight he directs on Jewish politics? I can’t quite answer the question, in part because Adelson is simply operating on a level—of influence, of cashflow—that I can’t comprehend. Instead, I think of Sholom Aleichem, who said that life was a game for the fool and a comedy for the rich. When I hear Adelson brag about how much money he’ll spend in 2016, I realize that he must be both.